Teethers, they are every teething baby’s must have! Their gums itch so badly when the little teeth are on its way out, thus our precious baby turns to bite their thumbs, fingers, or anything that they can possibly get their tiny hands on — the end result is a wet mess of drool at wherever their mouth has been! A good teether can help to ease a baby’s itching gum and it’d be so satisfying that the baby is willing to choose it over his thumb. Teethers come in every form — with cooling gel or without, with a rattle component or without — and these ones from Little Bearnie are Ethan’s current fav! They can keep him occupied for a long time and I do like the little touch of (name) personalisation in the teether. Read on for more. Ethan is picky even when it comes to teethers. If a particular teether is unable to satiate his annoying itching gum, he dumps that teether aside, moves back to his hands and forever remembers that teether as “the lousy one”. If I ever tried giving that teether back, he screams at me (poor mommy!). Hence whenever I hand Ethan a teether, it is more of a trial and error process. As you might probably have guessed, we have a ton of teethers at home now because of his fussiness — seven at the moment (not inclusive of the ones from Little Bearnie). 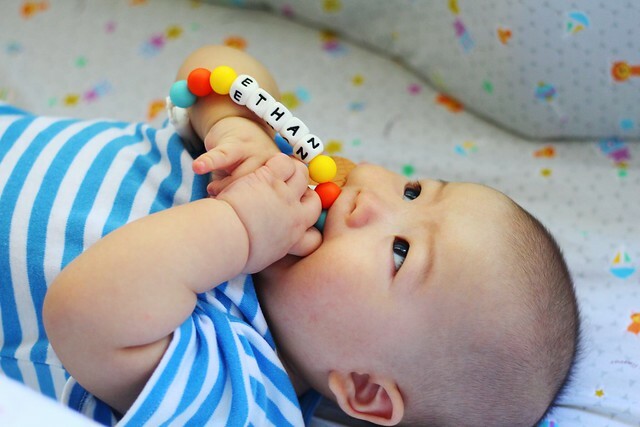 I feel safe giving Ethan the teethers from Little Bearnie as it is made of high quality 100% food-grade silicone that is safe and BPA-free. 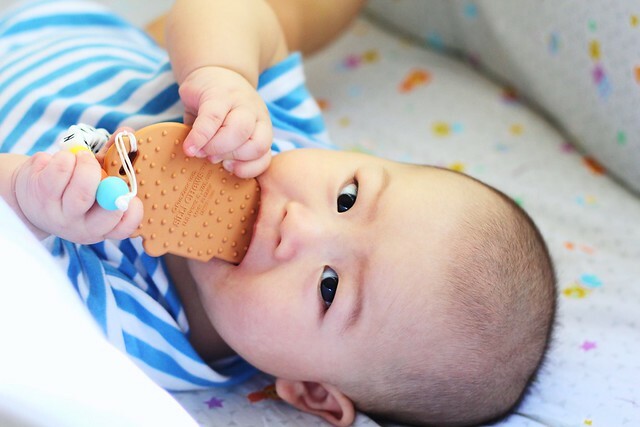 For the teething clipping set, the silicone teether is also designed with a textured surface to help soothe any teething pain – Ethan loves to use the textured side to rub the side of his gum which annoys him the most! In addition, the colourful appearance is attractive to babies and looks good when brought out (for shopping excursions)! For superrrrr particular parents (eg. my husband, the kiasu dad) who need to know what other chemical-free substances this product is from, you'll be pleased to know that the teethers from Little Bearnie are also PVC, Vinyl, Phthalate, Cadmium and Lead free. They are easily washable with soap and water, and can be chilled for added relief. It’s been two weeks since I introduced the Little Bearnie Teething Clip Set to my little one. His reaction to it now is still the same as his very first time. He fiddles it around in his little hands, chomps down on it, and his round eyes turn bright as he realises that it CAN ease his gum discomfort. 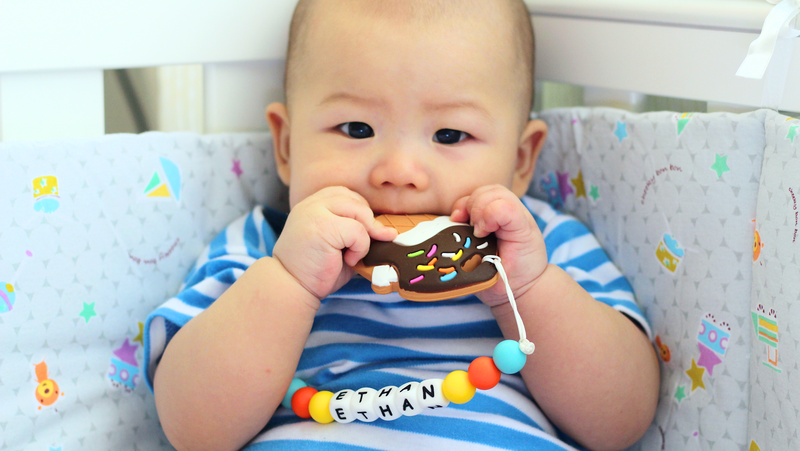 Ethan twists and turns it around, making good use of every side of the teether – from the bumpy underside on the ice cream teether to the smaller name beads – to get to every nook and cranny in his mouth that is causing him unease. Because the teether is clipped onto him, he can reach for it easily if the teether were to slip out of his hands. I've never seen him so satisfied with a teether and it can keep him entertained for a really long time! 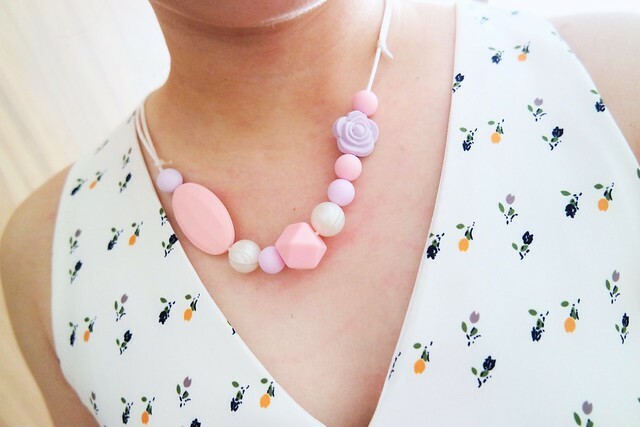 Another option for mummies to consider is this Teething Necklace. Do note: This is for mummies to wear, but for your little one to bite! You know how sometimes you have that dress which dreadfully needs a statement necklace to make it look good? Yet you hesitate wearing the necklace as you know that your curiosity-charged baby will reach for it and definitely put your chunky (toxic-filled) necklace in his/her mouth. 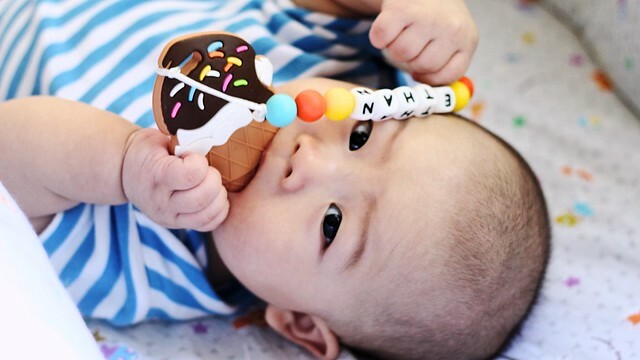 This food-grade silicone teething necklace from Little Bearnie is your saviour! Use it safely as a fashion accessory around your baby because you know that it is baby teething-friendly. Or if not you can also use the teething necklace as a distraction from your little one biting you (trust me, their "vampiric" days will come) when you are carrying him in your arms. Take a look here at the vast collection of teethers by Little Bearnie. Keen to purchase a teether for your baby? Then hey, I've got a promo code just for you! Quote [SOPH10] to enjoy a 10% discount off ALL products on Little Bearnie's website. 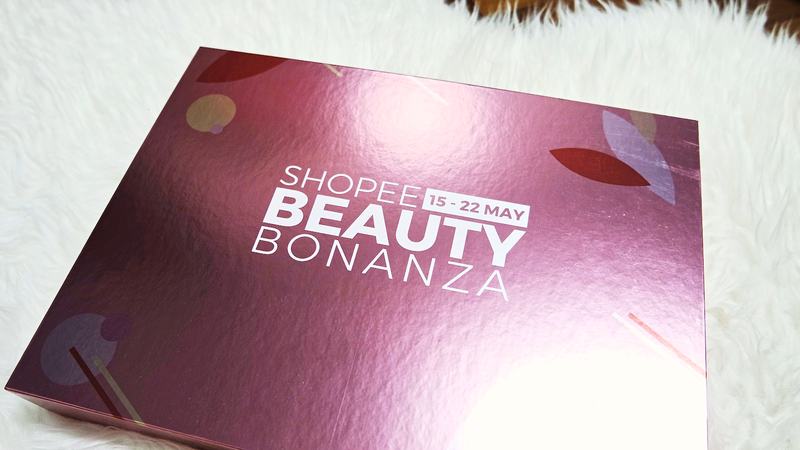 Shopee is back again with their fabulous Beauty Bonanza! And this year, they have over 100 participants beauty and health brands with products going for up to 80% off! The best part about this week-long sales? THEIR BRAND BOXES!!! I've got one in my bag and I am so ready to spill the loots & share with you. 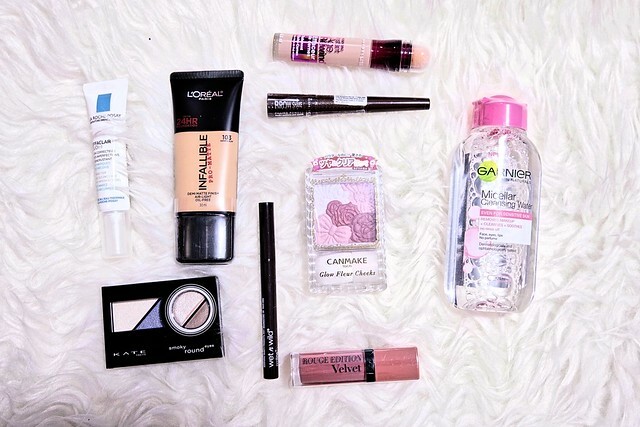 Read on to find out more about what goodies are held in my Shopee Beauty Bonanza Box. Running for the second year in a row, Shopee Beauty Bonanza 2018 is THE online sales event that you wouldn't want to miss. From 15-22 May, you can look forward to the participation of over 100 Health & Beauty brands – including popular favourites like L'Oréal Paris, Maybelline, La Roche-Posay, Kinohitmitsu and many more. With daily flash deals featuring products at the lowest price guaranteed, you can be sure that there is something for everyone to get all excited about! Grab your faves in makeup, skincare and health & wellness products for up to 80% off! Or perhaps... you're looking forward to this the most – their 12 exciting beauty brand box. 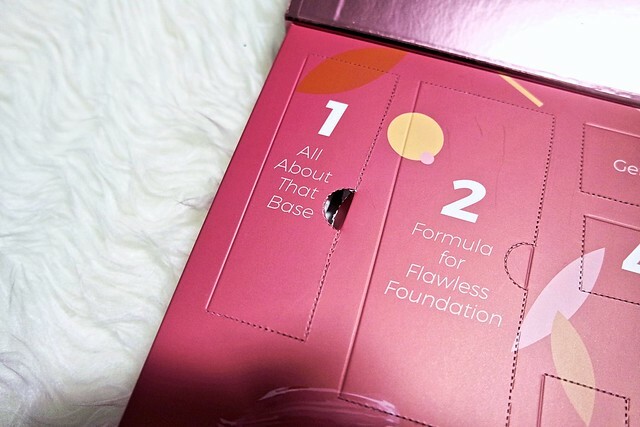 The ultimate beauty box that covers everything that you need – from base to foundation, to eye makeup and the perfect lippie to finish the look. 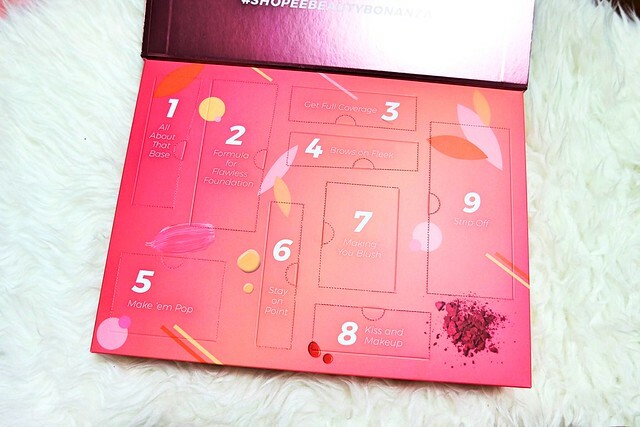 Here is what I like most about Shopee's Beauty Boxes... there are NO secrets. They tell you exactly what is in each box that you are purchasing, how much each item is worth, the total value of the box and how much little you have to pay. The savings are incredible!!!! In one of the beauty brand boxes, you get $100+ worth of products... you know what you will be getting in the box and that whole box is only sold for $30+! That is almost 70% off. Facial cleansing devices are not new in the market. 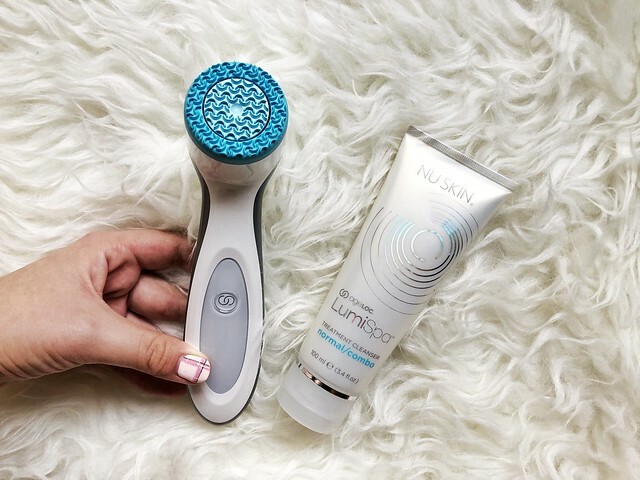 We started off with the manual fine-bristle brushes to electronic bristle brushes, and now we've got this soft silicone device from NuSkin. 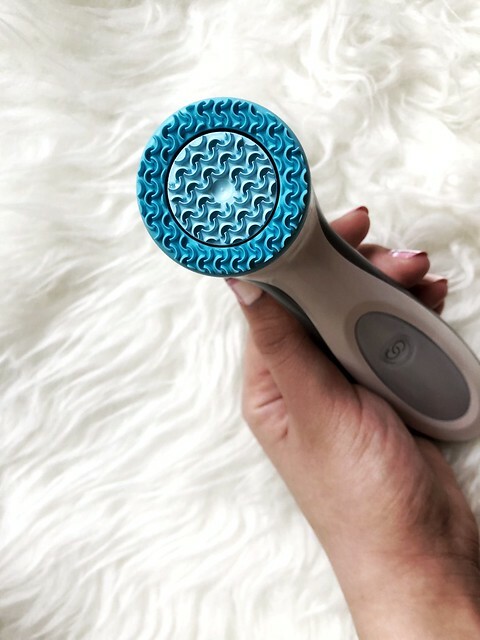 At first glance, it didn't look too promising in cleansing (I mean c'mon, we are comparing a soft silicone head with fine bristles – the logic behind friction had me gunning for the latter) but one week with this cleansing device changed my impression of it FOREVER. My face was cleaner than when I had used the electronic bristle brushes AND my skin glowed. I kid you not, it radiated like I had gone through a facial session. I was so tempted to get a device of my own, but the thing is... they ran out of stocks (at that point when I asked). It only goes to show how popular/wanted this device is! To know more about this revolutionary device, read on. 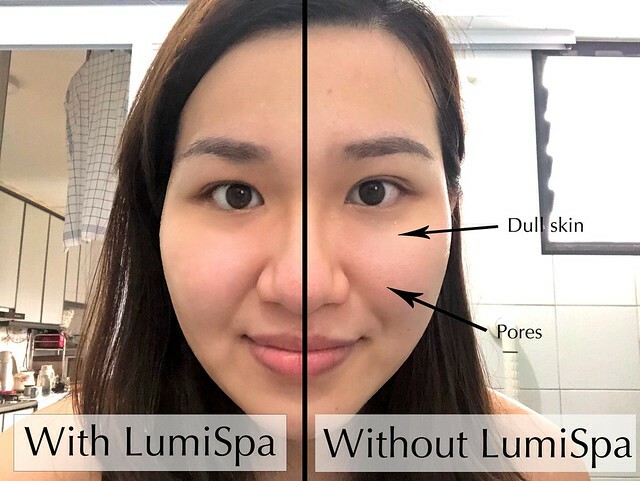 The ageLOC LumiSpa device is a waterproof, handheld facial skin cleansing device that is the "first of its kind" in the line of skincare devices. his nifty dual-action skincare gadget comes with a charging base and is able to help treat and cleanse our facial skin at the same time! Validated by clinical studies, it delivers a skin-perfecting treatment with superior cleansing benefits that I could visibly notice after just one use. I love it when brands back their products with science experiments. 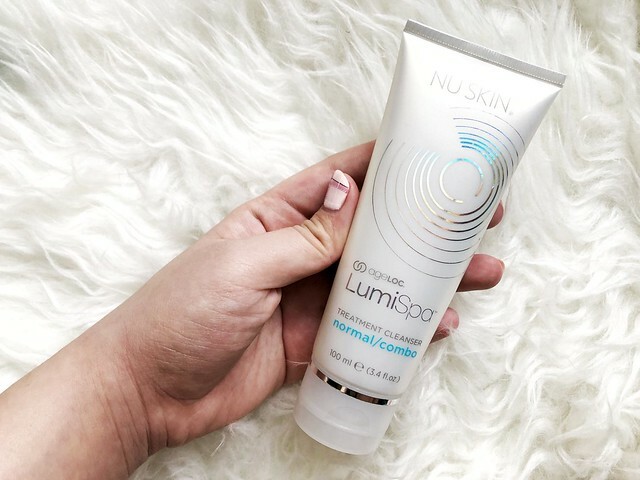 In the case of Nu Skin, they conducted several clinical studies during the development of ageLOC LumiSpa – and it included a 12-week study with individuals (who had used the product) reporting improvements in skin smoothness, softness, texture, clarity and radiance. The ageLOC LumiSpa treatment heads move at a precise frequency like a facial massage... but BETTER. The device uses a (patent-pending) counter-rotating action to purify pores — removing dirt, oil, makeup, pollutants and toxins in the process. It also delivers seven skin benefits which they claim would intensify with continued use. The treatment heads are made of a nonabrasive silicone surface that is more gentle and hygienic than your typical brush. Each head has a projected life of three months and is embedded with antimicrobial silver. The treatment cleanser come in five formulations to suit different skin types: dry, normal to combination, oily, sensitive and acne-prone. One week with the ageLOC LumiSpa device and I was so deeply in love with it. In fact, I fell in love with it from my very first try! As mentioned previously, I was hesitant about this device initially. 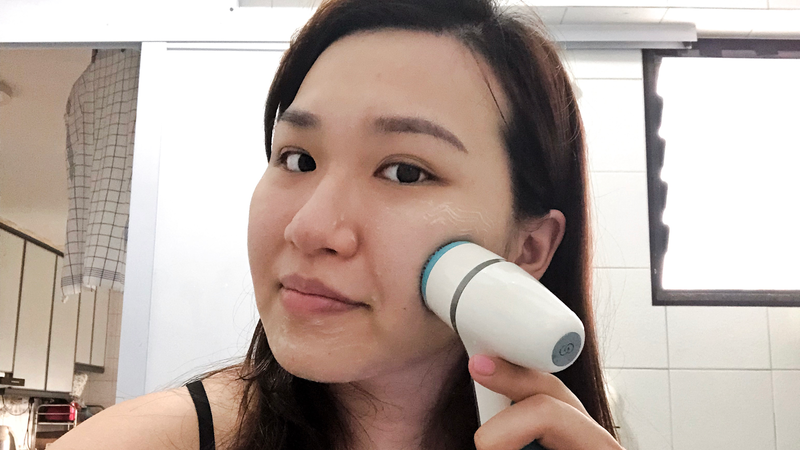 I was skeptical about the results that a face cleansing device could possibly bring – it sounded too good to be true! Even my "logic comes before everything" husband raised his eyebrow at me when I told him about it. Then again, you can probably already guess my next line. The benefits that they claim to be able to bring... it is TRUE! Hence the descriptive word "revolutionary". I have been waiting forever for the next product in the beauty world to completely wow me, and this one does the job so well. With this device and 2 minutes of your daily life, I can imagine less zits, lesser blackheads and perfectly glowing skin every day of my life. I like how the device has been timed to give a gentle buzz every 30 seconds to signify "hey it's time to move on and cleanse another spot". It rids me of the necessity to either stare at clock or to even count in my head – and of the two, I will more likely do the latter, thus making the timing absolutely inaccurate due to my tendency of counting really fast. Is it necessary to use their treatment cleanser? Yes if you want to reap the full benefits of the device. I have tried with and without the cleanser and I must admit that their cleanser does play a significant part for treatment. Without their facial cleanser, well... the device does a good job in cleansing but not so good in terms of treatment. I have also tried to remove a full face of makeup and I would say that it did a pretty good job. However just to be on the safe side, you might want to use some micellar water makeup remover to get rid of your eye makeup before stepping into the bathroom with this device. Speaking of bathrooms, do note that the device is water resistant but not entirely waterproof. Hence do not leave it to charge in your bathroom for safety reasons. For more information on ageLOC LumiSpa, you can click here. The starter pack which includes the device and a treatment cleanser (of your skin type) is currently retailing at $372 – which to me, is a small price to pay for perfect skin every day! 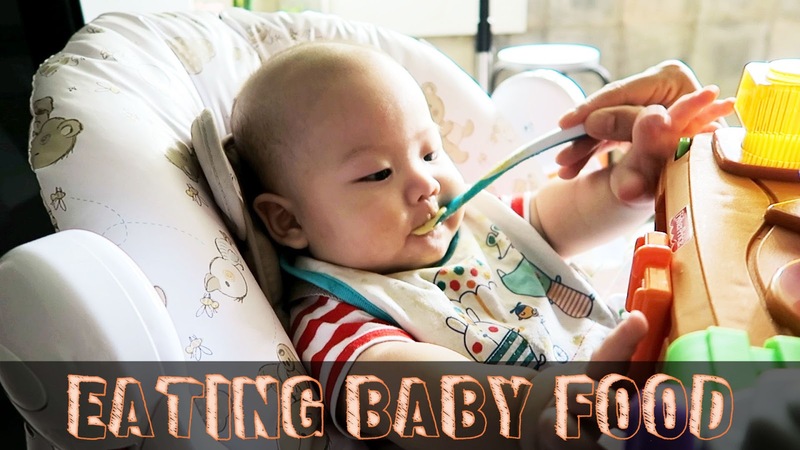 Mummy Chronicles: Milk-Weaning With Baby Ethan, We Are Now On Solid Food! This is a big milestone for every baby – their first bite of solid food! Parents panic and research a whole lot. What can we feed them? What can they eat? How to feed them? Which style/approach of weaning should you choose to adopt? For some, the transition is difficult. And for others, it is easy peasy like ABC. Fortunately for us, Ethan was the latter. He began showing an interest in food at an early age approximately around 3 months. Our visit to his paediatrician during his fourth month granted us the approval to begin solid-feeding. My baby boy was ecstatic! We started off with jar foods as we were keen to know what he was or wasn't interested in. Apple puree was our first choice and that was a terrible idea! Ethan screamed at us so badly and rejected the food. We were afraid that he wasn't ready for food yet, and confused at the same time because he showed keen interest in the apple puree. We switched it out to pear puree and it was an instant hit! Later on, we found out why he had put up such a huge protest against the apple puree... it was sour af. (Point to note: Never feed a fussy baby apple puree from a jar. ) He is fine with homemade apple puree, made out of either Organic Fuji Apple or Jazz apple. Yes, my baby boy is that picky and that specific – I blame his dad for the genes (LOL). For some brands, their baby rice contains milk powder inside (eg. Nestle) so all you've got to do is add your own water into the mix. We chose baby rice that came without milk powder as we would rather have the hassle in preparation and to provide Ethan with a more nutritious formula milk (or even expressed breastmilk)! Baby rice comes in either a finely-milled powder form, or "crystal-like" granulated bits. Personally I prefer the powder form as the porridge made would often appear smoother. Ethan accepted the baby rice without a hitch and soon, we began adding vegetable purée into the porridge to give his food more nutrition. As dessert, we would give him three spoonfuls of fruit purée to prevent constipation. I have begun cooking my own chicken broth to add into his purée and of late, we've also tried adding in chicken breast meat and salmon. I'm going to be very honest and share that both types of protein contributed little to no additional flavour to the porridge. I aren't expecting Ethan's porridge to taste salty or anything, but I was hoping to give it some depth of flavour such as how the addition of pumpkin purée makes the porridge sweet! In the coming weeks, I'll be sharing a couple of my baby recipes. One of them is Ethan's favourite – Chicken, Corn and Carrot Purée blended with Homemade Chicken Broth! For now, here is a simple starter baby purée: "Pumpkin & Broccoli Purée". Click the video to watch how I made it and do subscribe to support us!